Summary: Researchers report those who use sign language have better peripheral vision and faster reaction times. People who use British Sign Language (BSL) have better reaction times in their peripheral vision, a new study from the University of Sheffield has found. The findings, revealed by scientists from the University’s Academic Unit of Ophthalmology and Orthoptics, show that hearing adults learning a visual-spatial language such as BSL has a positive impact on visual field response – something which is highly beneficial in many sports and when driving. Dr Charlotte Codina, lead author of the study and Lecturer in Orthoptics at the University of Sheffield, said: “We were surprised by the quicker response times of BSL interpreters, who haven’t necessarily known sign language since childhood, but have improved their peripheral visual sensitivity in learning this visual language and using it daily. The pioneering research also found deaf adults have significantly better peripheral vision and reaction times than both hearing adults and BSL users, providing scientific evidence to support the common belief that losing one of your five senses, such as hearing, can enhance others like sight or smell. Hearing adults who use British Sign Language (BSL) have better reaction times in their peripheral vision. NeuroscienceNews.com image is credited to Wellcome Images. “We found that deaf adults have faster reaction times around the whole of the visual field, extending as far as 85 degrees peripherally near the edge of vision,” said Dr Codina. “Our study shows that deaf people have exceptional visual abilities that hearing adults do not. BSL is the most common form of sign language in the UK and is used by around 145,000 people. It has its own grammatical structure and syntax and as a language it is not dependent nor is it strongly related to spoken English. Image Source: NeuroscienceNews.com image is credited to Wellcome Images and is licensed CC BY 4.0. University of Sheffield “Sign Language Users Have Better Reaction Times and Peripheral Vision.” NeuroscienceNews. NeuroscienceNews, 6 February 2017. University of Sheffield “Sign Language Users Have Better Reaction Times and Peripheral Vision.” http://neurosciencenews.com/sign-language-peripheral-vision-reaction-6071/ (accessed February 6, 2017). Following auditory deprivation, the remaining sense of vision has shown selective enhancement in visual cognition, especially in the area of near peripheral vision. Visual acuity is poor in the far periphery and may be an area where sound confers the greatest advantage in hearing persons. 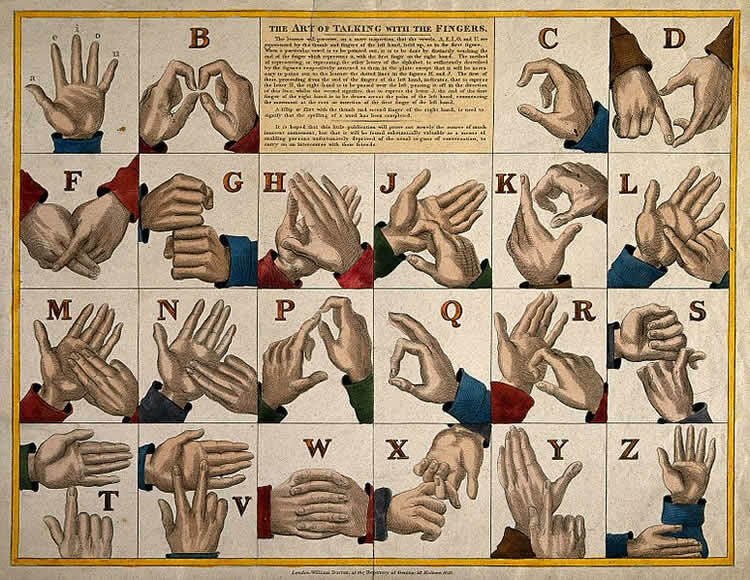 Experience with a visuospatial language such as British Sign Language (BSL) makes additional demands on the visual system. To test the different and separable effects of deafness and use of a visuo-spatial language on far peripheral visual processing, we investigated visual reaction times (RTs) and response accuracy to visual stimuli, between 30° and 85° along the four cardinal and four inter-cardinal meridians. We used three luminances of static, briefly illuminated stimuli in visually normal adults. The cohort tested included profoundly congenitally deaf adults (N = 17), hearing fluent BSL users (N = 8) and hearing non-signing adults (N = 18). All participants were tested using a peripheral forced choice paradigm designed previously to test deaf and hearing children (Codina et al., 2011a). Deaf adults demonstrated significantly faster RTs to all far peripheral stimuli and exceeded the abilities of both signing and non-signing hearing adults. Deaf adults were significantly faster than BSL interpreters, who in turn were significantly faster than hearing non-signing adults. The differences in RT demonstrated between groups were consistent across all visual field meridians and were not localized to any one region of the visual field. There were no differences found between any groups in accuracy of detecting these static stimuli at any retinal location. Early onset auditory deprivation appears to lead to a response time visual advantage in far peripheral responses to briefly presented, static LED stimuli, especially in the right visual field. Fluency in BSL facilitates faster visuo-motor responses in the peripheral visual field, but to a lesser extent than congenital, profound deafness.